China has shut down the Chinese websites of Marriott International for a week, after the firm listed Tibet and others as separate countries. The hotel group has apologised for the error and said it did not support separatist movements in China. Tibet, Taiwan, Hong Kong and Macau were listed as individual nations in an online survey sent to customers. Beijing considers self-ruling Taiwan to be a breakaway province and Tibet is governed as an autonomous region. Hong Kong and Macau are both special administrative regions of China. Marriott was also chastised after one of the firm's social media accounts "liked" a post made by a group supporting a separatist Tibet. 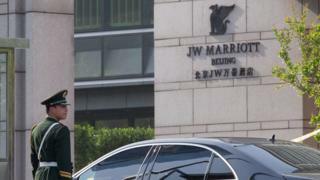 Chinese media is reporting that some travellers are cancelling Marriott reservations in response. China is usually quick to respond to any actions or statements it deems supportive of separatist movements, especially related to Tibet and Taiwan. While the hotel's international website is still available within China, the Shanghai Cyberspace Administration ordered it to close a Mandarin version. Authorities also shut down Marriott's Chinese mobile phone app as part of its punishment for the Mandarin-language survey. But having being closed earlier, the app now appears to be functioning. On Thursday the hotel group's chief executive Arne Sorenson issued an apology, saying his firm "respects and supports Chinese sovereignty and its territorial integrity". "We don't support anyone who subverts the sovereignty and territorial integrity of China and we do not intend in any way to encourage or incite any such people or groups," Mr Sorenson said. "Unfortunately, twice this week, we had incidents that suggested the opposite." The statement added that the company would take "necessary" disciplinary action against staff involved, which may include termination. Mr Sorenson has previously described China as his firm's biggest market. While Marriott has over 100 hotels in the country under different brands, it is also keen to profit from the swelling number of Chinese people travelling internationally. Last year it launched a joint travel venture with China's ecommerce giant Alibaba.